How did you become a Davy/Monkee fan? Watching re-runs of the tv show on Saturday morning tv. Forgot about it and then caught some more re-runs in the 90's which got me into the Monkees big time. How long have you been a Davy/Monkee fan? Why do you love Davy? Because he's funny, he's never embaressed about being a Monkee or a teen idol, he's honest, he's flawed, he's fiesty, he can be a complete sweeteheart, he's cheeky, back in his hey-day he was just about the cutest thing i've ever seen in my life and he's always been true to himself. What's your favorite Davy/Monkee Song? Star Collector and Man Without A Dream. Have you ever seen Davy In concert, and/or met him? If so, what was it like? I saw him perform with the other three Monkees in concert when they toured England in 1997 - it was absolutely fab and one of my most treasured memories. Have you ever met one of the other Monkees and/or seen one of their concerts? How many Davy/Monkee Cd's you own? I own all the Rhino re-issue c.d's and a couple of greatest hits c'd's aswell. What was the first Davy/Monkee song you ever heard? Have you ever written to Davy? If so, did he reply? Do you own any Davy/Monkee memrobilia? Favorite Monkee (other then Davy)? Where *you* named after one of them Monkees? How many Monkees songs do you know by heart? Back to the Future, Moulin Rouge, The Truman Show, Forrest Gump, West Side Story, Teen Wolf, The Faculty, Dead Poets Society, Wizard of Oz, The Frighteners, The Goonies, The Lost Boys, La Bamba, Little Shop of Horrors, Van Helsing, The Mummy, Pirates of the Carribean, Beauty & the Beast, Clue, LOTR's Trilogy, Grease 2, Edward Scissorhands, Big Fish, all the Harry Potter films, Sound of Music, Carousel, High Society, Eternal Sunshine of the Spotless Mind and about a million more. I *love* movies!!!! The Flowers in the Attic series, all the Harry Potter books and Lucky Man by Michael J Fox. Some godawful book i tried and failed to read about Mark David Chapman, a waste of good ink on an unworthy awful person. Cold Case, Supernatural, Quantum Leap, Doctor Who, Surface, Invasion, Spin City, Family Ties, Futurama and of course The Monkees! Other favorite songs (non- Monkee that is)? Michael J Fox, Elijah Wood, Ewan McGregor, Johnny Depp, Natalie Wood, Judy Garaland, Doris Day and most of the old Hollywood musical stars. Erm....save the texas prarie chicken?!?! That was very amusing. I'm glad you decided to take the questionnaire. I'm hoping to start with the contests soon. They would be more exciting with more people, but it may take people a while to warm up to the new community. 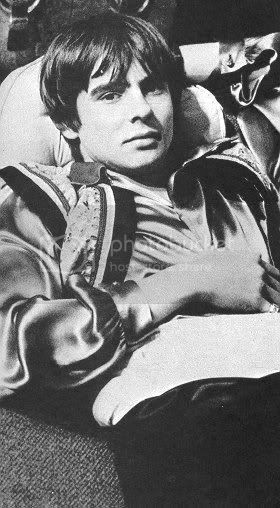 Yep, thats one of my favourite Davy pics...sooooo pretty!